Believe it or not, I did cool stuff before I owned LivinDeliberately.com. A lot of cool stuff actually. I have really great parents who were and are very against using the TV as a babysitter, and used their precious weekends to get me and my siblings out into the world to see cool stuff. Every once in a while I’ll stumble across a great memory and wish I could go back and re-experience it. So that’s just what I’ll be doing with this series. Old memories, with a fresh take. From the California coast to the Maine woods, the Florida Keys to the Georgia hills, all those memories that happened before Livin’ Deliberately, but shaped it greatly. We moved to South Florida when I was in middle school, in 2008 or 2009 I believe. The main thing in Florida for me was (you guessed it) baseball. However, when I think of Florida now, I don’t think of the run down fields of Hialeah or playing against and with guys that are now in the pros or championships or really anything baseball related. I think of the Keys. The Florida Keys start about 15 miles south of Miami, extend out to a point where they’re only 90 miles from Cuba, and take up only about 153 square miles of land. They take up about a massive amount of space in my family’s daydreams though. We went to the Keys for the first time when I was a freshman in high school with way too much hair and way too little of an appreciation of nature. It was impossible not to love the Keys though. 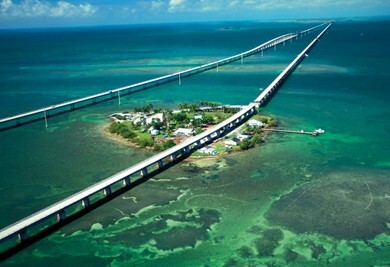 We made the two hour drive over the 127-mile, one lane Overseas Highway all the way down to Key West. For lifelong Jimmy Buffett fans like my parents this was more then a weekend trip, this was a pilgrimage. We payed homage at The Original Jimmy Buffett Margarita Cafe, wore goofy parrot masks, and heard “Cheeseburger in Paradise” several dozen times while eating cheeseburgers in paradise. After dinner we went full-blown Key West tourists, walking through Mallory Square during the nightly Sunset Celebration, which features street vendors, performers, food carts, and a heavy state fair vibe without the seediness of a state fair. There was a whole market just for sponges. We saw Interstate 95’s Mile 0 marker, saw a guy juggle flaming torches, and visited the southernmost point in the country. It was awesome, but it was only just the beginning of the Neville love affair with the Keys. What cemented my love for the Keys went down on our next trip. We camped on Long Key, right on the white sand with the most crystal blue water you’ve ever seen ten feet away. And all it cost was under $50 for a tent site and the gas to make the two-hour drive there. We’d take Pop’s trusty Old Town Canoe out 500 yards or so from the shore and snorkel in a pristine coral reef. For free! Surrounded by fish, we’d dive deep and try our hand at catching lobsters with nothing but our hands and a net. We weren’t very good, only caught a few that were too small to keep, but eight years later that’s still one of the coolest things I’ve ever done. I drove for the first time, in our old minivan, down the immensly beginner friendly one lane staight as an arrow Overseas Highway. I vividly remember trying to catch crabs with Emily on the beach at night, only to look up and see the distant lights of Miami. They were so bright I thought the sun was rising at 8:00 at night for a split second. Climbing a mangrove tree and jumping off into the ocean, thinking I was some kind of oceanic Huck Finn. Fishing with my dad in water so clear you could place the lure right on top of the fish. Paddling in from lobster hunting once and meeting a massive loggerhead turtle. I immediately jumped out of the water and hung out with him until he moseyed away some time later. I could go on and on, and if you asked my mom for some memories she could go on even longer. I didn’t even mention the time it rained so hard we had to sleep in the minivan because our tent flooded. My obsession with the outdoors and adventures wasn’t an overnight development. It was a series of events that gradually built up to what it is today. No one event is more important than the other, however it’s fair to say that the Florida Keys form the bulk of the foundation. Below are some photos my mom took across our various trips. She’s said for the last couple Christmas that “next year we’re doing Christmas in the Keys” and I believe she’ll talk my dad into it eventually. And when Colleen and I go on our Great American Road Trip later this year, our first stop is already penciled in as the Keys. Can you really blame us? Look at the Hair! Total Playmaker. Southernmost Point in the U.S.. Also highest contrast of dudes in orange shorts. My mom taught me to take great photos, this is one of her best. Follow Livin' Deliberately via Email!